Try to read this passage as if you were Mary Magdalene. When Jesus died, your world became dark and silent. Though your heart is still beating, you are as dead as the stone rolled across His tomb. You are numb, beyond grief and zombie-like as you go through the day’s routine. Then you notice some things. The stone is rolled away. The grave clothes are there, but the body isn’t! You conclude, “Someone has stolen the Master’s body!” You are so freaked out, you don’t know what to do. You see a couple of people who try to help you, but you really don’t notice them. Another guy tries to help you, but you’re so focused on the missing body… that voice? Then he calls you by name, and slowly you look up and you see … Jesus! Mary, your world has just been rocked! Do you feel it? Whenever you really see the Risen Jesus, your world gets rocked. I’m convinced that angels didn’t move the stone in front of Jesus’ tomb. 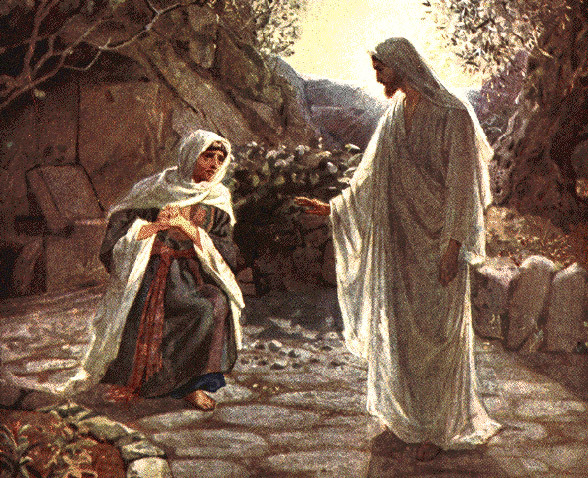 The presence of the Risen Christ caused the stone to move itself. It’s amazing what comes alive when they realize that Risen Jesus is there! Jesus wants to rock your world. He wants to bring in life, transformation, love and redemption. He wants to take away fear and smallness of heart. Sometimes we get caught up in trying to be Christians and we forget to see Christ. Look up! See the face of Christ! Fall to your knees! Let your world be rocked!